Posted by: Mambaon 2012/4/29 23:30:00 9052 reads After XOOPS was selected over several other competing CMS solutions to power the new Website of the Libyan Ministry of Defense, another high profile institution in Libya has selected XOOPS - this time the Libyan High National Elections Commission! As in the previous case, they felt that XOOPS provides the best combination of features, security, and support. They also liked the modular approach of XOOPS, and the ease of adding new functionality by installing additional modules. And they felt that with the continues development of new XOOPS versions, there is a guarantee that XOOPS will be around for a long time. 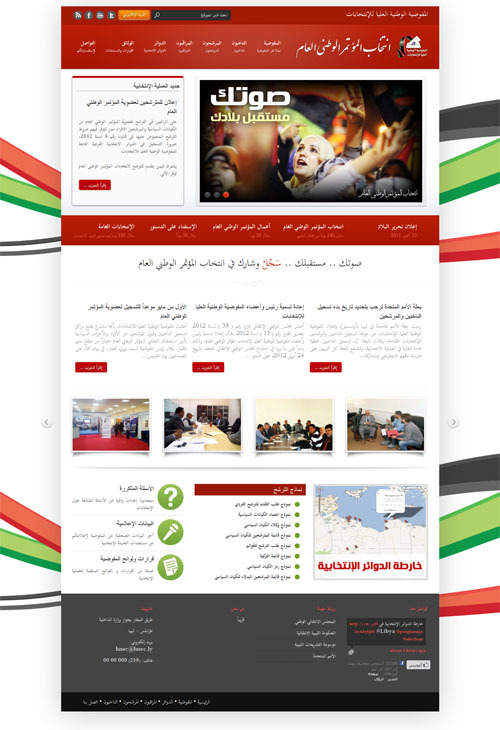 As in previous case, it is thanks to the hard work of Mowaffaq and his team from www.arabxoops.com, who were able to successfully demonstrate the value of XOOPS, and address all the questions from the technical stuff of the High National Elections Commission. We are very proud that XOOPS has been selected by national, state, and local governments around the world, like State of Parana in Brazil (http://www.cidadao.pr.gov.br/) or Tainan County in Taiwan. Great great news, and very cool design. Congratulations! I love the design and of course this is a great news. They should set up a xortify cloud on xortify.gov.ly so they can have clean anti spam and so on, they can link it into my cloud, they should also have xoops.gov.ly for a libyian support site for there modules that get realease for the open gov model that is implementable in the condition of the lybia at the moment. Why have a culture of silence and secrets like western sectarian old hat, you need your department with API and classification tenures of 5,7,15 & 30 years otherwise emails, documents everything available on API so the community audits, it like Open Gov is for. You also collect alot more information having API administration, in this site for example you could have electronic voting coming over API to the website itself and have real time statistics.. Anyway, I am willing to help, but i am an atheist and don't know arabic. or persian but willing to learn. I am from Australia, my details are current on my profile. See on #OpenGov the model is on tooo much information provided that viel of secracy, and services like WikiLeaks don't work in an open government cause it is open, there is nothing to disclose.